Camfil Farr side-access filter housings for cylindrical sorbent canisters are recommended for high gas/vapor load make-up air and recirculation applications. Up to 96 pounds of impregnated carbon per 2000 cfm of system capacity and a gasketed seal provides a higher capacity and removal efficiency than other adsorbent systems. 2" pleats tracks at entry and exit sides. Medium-capacity odor and contaminant control in a low pressure drop side access housing.The Camsorb® RS Glide/Pack® can be used for commercial applications, industrial applications, manufacturing facilities, medical facilities or any other applications where the control of gaseous contaminants may be a concern. It may also be used to reduce ventilation air through recirculation, thus saving energy during the heating and cooling seasons. The Camsorb RS Glide/Pack is an excellent choice for ventilation air correction in areas of non-attainment per ASHRAE Standard 62.Each unit provides side-access housing convenience, for interior or exterior installation, where the housing mates to other housings or a ducted HVAC system. Medium-capacity odor and dust control in a low pressure drop built-up bank system. The Camsorb® RS80 Retainer/Pack can be used in commercial applications, industrial applications, manufacturing facilities, medical facilities or any other applications where the control of gaseous contaminants may be a concern. It may also be used to reduce ventilation air through recirculation, thus saving energy during the heating and cooling seasons. The Camsorb RS80 Retainer/Pack is an excellent choice for ventilation air improvement in areas of air quality non-attainment per ASHRAE Standard 62. Each adsorber module is a single unit that may be stacked up to four units high, and any number of units wide, to form a complete filter bank. 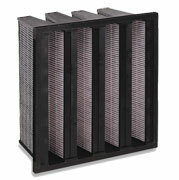 Each module may include 48 pounds of adsorbent, a prefilter or dusting filter and a high efficiency particulate filter. 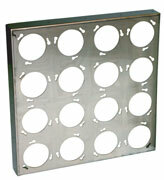 2-inch panel for removal of odors or cleaning of make-up air at medium loads. Camfil Camsorb® RS 80 two-inch panels can be used to control odors or limit VOC exposure created by contaminants in the typical office environment. They may also be used in areas of non-attainment to clean make-up air before it is introduced to the indoor environment. A 2-inch bypass panel for control of low level to intermittent odors and low-level ozone removal in non-EPA compliant areas. Camfil Camsorb RS25D panels can be used to control low-level or intermittent odors, and/or reduce ozone levels in geographic areas of EPA non-compliance. High-capacity gaseous contaminant and odor control in a side- access filter housing. The Camfil Camsorb two-stage side-access sorbent panel housing can be used in commercial applications, industrial applications, manufacturing facilities, medical facilities or any other applications where the control of odors and gaseous contaminants are a concern. The housing can also be used to reduce make-up air by increasing recirculated air, thus reducing energy costs during the heating and cooling seasons. The Camsorb 3CF Glide/Pack® housing provides side-access convenience for interior or exterior installation. It is designed to mate to other housings or installed in a ducted HVAC system. High-capacity gaseous contaminant and odor control in a modular, built-up bank assembly. The Camfil built-up bank sorbent panel assembly can be used in commercial applications, industrial applications, manufacturing facilities, medical facilities or any other applications where the control of gaseous contaminants or odors may be a concern. It may also be used to reduce outside air by increasing recirculated air, thus saving energy during the heating and cooling seasons. Each Camfil built-up bank adsorber module assembles into a built-up bank of gaseous and particulate filtration with 85 pounds of adsorbent per 2000 cfm, a prefilter (of any depth) and a final filter (of any depth). High-capacity loose-fill plastic panels for gaseous contaminant & odor removal. The industry standard for practical odor control, Camfil 1-inch polystyrene panels (formerly known as Farr CF panels) were the first high-velocity ‘straight through’ carbon purification filters available. Recommended for high gas/vapor load make-up air and recirculation applications, where high removal efficiency and a large quantity of sorbent media is required. The Camsorb® Pleated V-Cell Cartridge Filter is designed to fit in place of existing 12" deep filters within an air-handler. Use of the Camsorb Pleated V-Cell Particulate + Carbon Cartridge Filter for dust, pollution and odor control. Camfil’s Campure™ GDM 440 Adsorber Modules incorporate Campure Molecular Filtration Media in an easy-to-service disposable plastic module. Designed to remove corrosive gases from make-up air streams in commercial/industrial environments. Exact replacement for existing commercial & industrial make-up air systems. Camfil’s Campure™ GDM 300 Adsorber Modules incorporate Campure Molecular Filtration Media in an easy-to-service disposable plastic module. Designed to remove corrosive gases from exhaust streams in industrial environments. Exact replacement for existing industrial exhaust systems. The Camsorb® CH Loose-Fill V-Cell Cartridge is recommended for reduction of modest occupancy odor loads, peak-shaving* of ambient air pollutants, and continuous control of low-level gaseous contaminants in make-up and air recirculation applications. 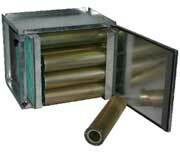 It is a cost effective filter for control of odors and outdoor pollution. The Camsorb CH Loose-Fill V-Cell Cartridge may be installed in any HVAC application where the use of outside air for contaminant dilution is burdensome and cost-prohibitive to the building operator. Use of the Camsorb CH Loose-Fill V-Cell cartridge for contaminant adsorption and removal allows for minimal introduction and conditioning of outside air, thereby significantly reducing energy costs associated with heating and cooling of required make-up air where a sorbent filter is not applied. This method for contaminant removal is specifically prescribed in the ASHRAE Standard 62, Ventilation for Acceptable Indoor Air Quality. Combines high-capacity sorbent canisters with built-up bank frames for large system gaseous contaminant control. Camfil built-up bank holding frames for cylindrical sorbent canisters are recommended for high gas/vapor load make-up air and recirculation applications. A sorbent media capacity, of up to 96 pounds per 2000 cfm, provides a higher removal efficiency than other sorbent systems. This higher media volume also ensures a higher contaminant loading capacity than standard HVAC adsorption systems. Frames are ideal for large system retrofits, custom air handling systems and other HVAC systems handling large volumes of air. When properly installed, the combination of Camsorb holding frames and Camsorb sorbent canisters ensure that virtually all of the air flowing through the system will be efficiently treated by the filters. Low pressure drop particulate filtration combined with odor control. The City-Flo bag filter is a totally new combination dust and odor control filter designed for urban environments. Ideal for office buildings, retail stores, shopping centers, schools and other public buildings, located in close proximity to heavily trafficked streets and roads.